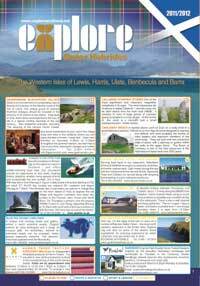 Stornoway is the main town on the Isle of Lewis and is also the home of the Western Isles Council. Just over 6,000 people live in the town, which represents about a third of the Islands total population. The economy is a mix of traditional businesses like fishing, Harris Tweed and farming, with more recent influences like Tourism, the oil industry and commerce brought about by the digital revolution and communications. Stornoway is the main port on the Island, due to its sheltered location with the ferry to Ulapool a regular visitor. The sheltered harbour is the reason for Stornoway's existence and was named by the visiting Vikings "Steering Bay" which, when phonetically translated, became the name Stornoway. The town has a wide range of facilities ranging from a large secondary school, (Nicholson Institute) and technical college, to sporting facilities, which includes a brand new sports complex. The complex would be the envy of most mainland small cities with its 25 metre pool, climbing walls, fitness suite, soft play etc. Click here to see more in detail. The town also has a Golf Course, Astro Turf pitch, Go-Carting and even a paintball action area. Cruises around the area by boat are available during the summer months, embarking from the pontoons behind the Lifeboat Station. Cultural facilities are well catered for with a good museum, art gallery and library. An Lantair, a brand new arts complex was opened in summer 2005. Download the guide for 2011/12. Copyright Explore Scotland Ltd, All Rights Reserved.